Karlštejn Castle (Czech: Hrad Karlštejn; German: Burg Karlstein) is a large Gothic castle founded 1348 AD by Charles IV, Holy Roman Emperor-elect and King of Bohemia. The castle served as a place for safekeeping the Imperial Regalia as well as the Bohemian/Czech crown jewels, holyrelics, and other royal treasures. 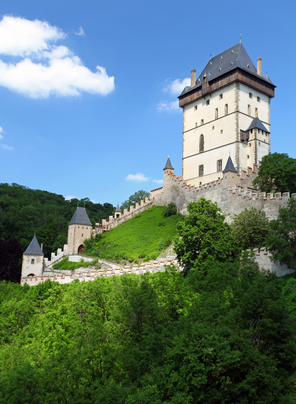 Located about 30 km southwest of Prague above the village of the same name, it is one of the most famous and most frequently visited castles in the Czech Republic. Would you like to book a trip? Please feel free to contact us.